I love a good sheet mask. It's my Sunday self care pamper - and I am so pleased that they were invented! 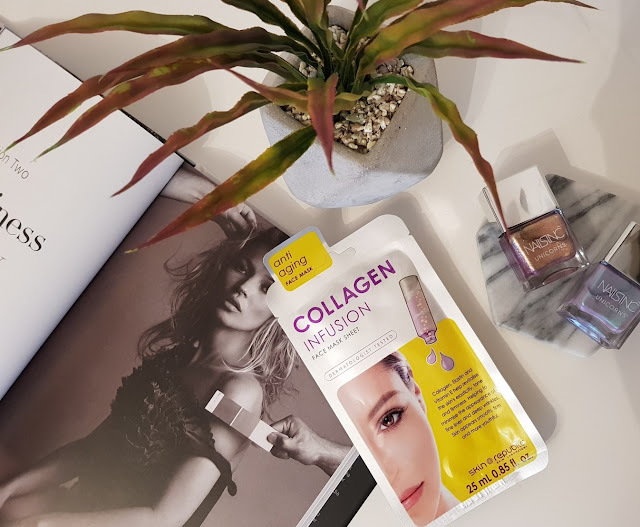 I was lucky enough to be sent a fab new Collagen Infusion sheet mask from Skin Republic, it helps with anti ageing, is Dermatologist tested, and it's just a joy to use. 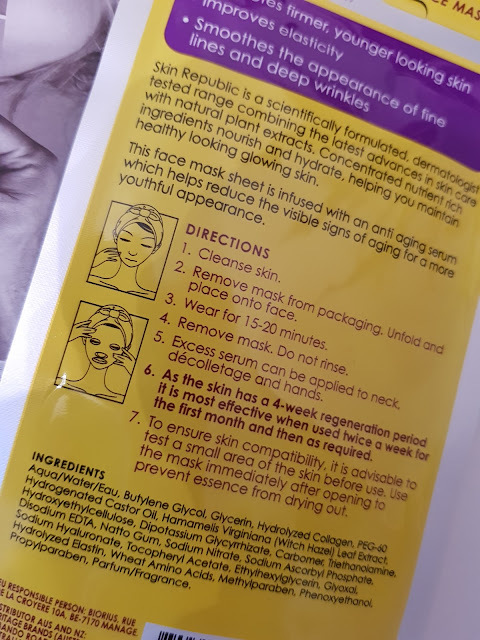 You can see me looking like a right nutter in the photos below - have you tried sheet masks before?? 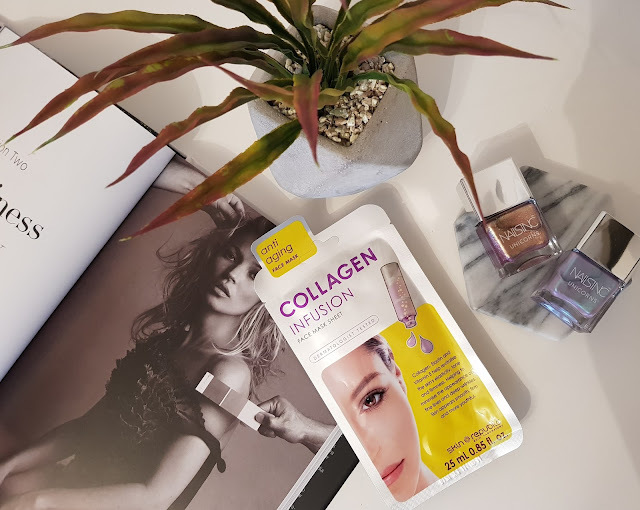 I really like the packaging - you get 25ml worth of product with the Skin Republic Collagen sheet mask; so there's plenty to rub in your skin once your 15 - 20 minutes is up. 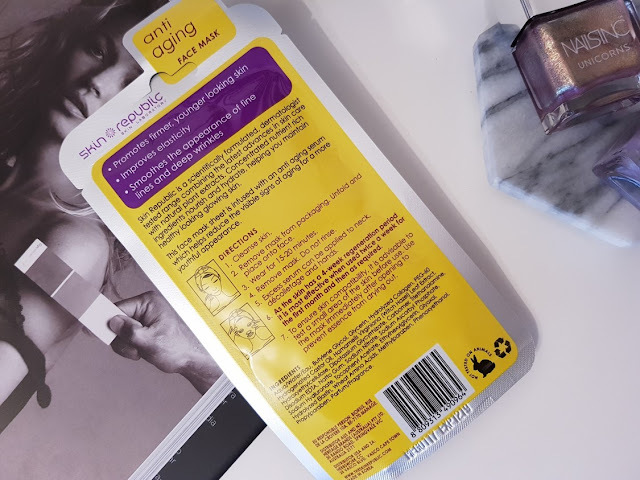 The Anti Ageing Skin Republic sheet mask promotes firmer younger looking skin, it improves elasticity, smoothes the appearance of fine lines and deep wrinkles. Scientifically formulated, and dermatologist tested - you can really trust that the sheet mask is going to do good for your skin. I have a dry skin, even more so in the colder months, and I really loved the soothing effect of this sheet mask. My hair went up, I cleansed my face and applied the Skin Republic sheet mask, I also ran a bath, once my bath was ready I relaxed and left the sheet mask on for 20 minutes. My skin wasn't irritated, it was cooled and soothed by the collagen mask. Containing elastin, Vitamin E, Collagen - once my 20 minutes was up, I removed the sheet mask and put it back into it's foil wrapper for disposal. I used the residue of the mask to massage into my skin. I must say, this has to be the best sheet mask I have ever used. My skin was plump, moisturized, soothed and evened out in tone. I didn't need to use a moisturiser - which from previous experiences I have had to do. Some sheet masks leave my dry skin wanting more moistirisation, and the Skin Republic sheet mask didn't do that at all. So will I be purchasing the Skin Republic sheet mask again?? Yes most definitely! I noticed the hydration immediately, I liked the calming scent, and my favorite part was the suppleness of my skin afterwards. 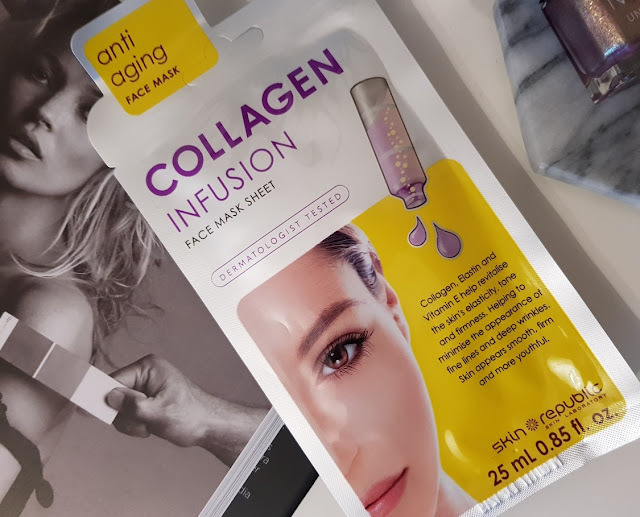 The packaging states "As the skin has a 4-week regeneration period The masks are most effective when used twice a week for the first month and then as required. 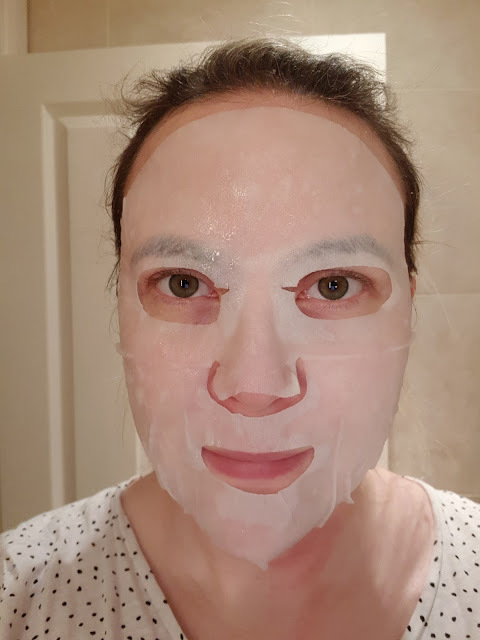 Apply just before bed for best results"
This is the first time I have used Skin Republic products, and the first time noticing a company giving advice on how often to use sheet masks - I am really impressed with their advice and the efficacy of their products. Have you tried anything from this range before?